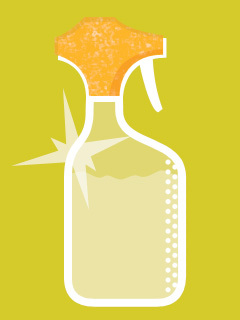 The white vinegar does most of the heavy cleaning, but the essential oils offer a great smell as well as anti-fungal and anti-bacterial qualities. This product leaves counter tops and sinks shiny and clean. Since all products are edible, don’t worry if food comes in contact with a clean countertop. Use baking soda for stubborn stains and dried spills. Simply shake baking soda over the problem area and then, use the spray cleaner to wet the baking soda. You will see bubbles working to loosen the dirt. With a damp towel, scrub the spray/baking soda combo to remove the stain. If needed, give the spot a few extra squirts of spray cleaner to remove any leftover baking soda. Leah R. Troiano, a certified cancer support educator, works with people who have cancer or would like to prevent cancer. Lowering toxicity is just one of many ways to get your body in cancer-fighting shape. For more information, visit CancerHealthandWellness.com or e-mail Leah@CancerHealthandWellness.com.